Like many things, I have to agree with an often overlooked corner stone of the Google empire, that started right at the inception of this life/behavior changing company. It seems the little known players Sergey Brin & Larry Page had been experimenting (with different social scenes, of course) during University and attended a now world famous event: The Burning Man (wiki). In fact, the key reason why they hired Eric Schmidt was because he was the ‘only candidate who had been to Burning man’, pretty obvious indicator of the sentiment by our Google overlords. If this isn’t enough, the very first ‘doodle’ was actually a scribble of the burning man (the effigy burned at the close of the festival, which became its namesake). But why discuss Google? I mean, you wouldn’t jump off a metaphorical bridge and follow them to Bing if they sold out right? The point is I have your attention to some of the most successful characters in the industry (right now), and with their philosophy on this subject, I have to completely agree with them! What better way to get to know your work mates? Your peers? Your fellow man? (your fellow alien?) Other than to get so completely, absolutely and absurdly out of your perceived comfort zone. If only for a few days. Every self-help book cluttering up the interesting sections of your local bookstore are filled with methods and techniques to change and alter the way you perceive your surrounds, looking at the world at a slight tilt different to your day to day. Seriously, its a pretty far jump from a programmers day to day, frolicking around the fields, in sunshine (yes – it exists), taking in the smells, the jaw dropping sights, the amazing sounds, the good, the bad and the ugly. So when you’re considering your new year resolutions, or better yet, that ‘thing you should try once’ this year/month/week. Try a festival, something really detached from anything that you would normally do. Rope in some friends, share the experience. Make the most of it, you just might like it. You have nothing to lose, and everything to gain. The unfortunate truth of many of these festivals are a steeper slope of acceptance the older we get, so why not try it now. I know I’d rather look back when I’m 97, sitting on my Atari 2600 wondering why the toilet paper isn’t coming out, reflecting back on my life and thinking about the event, and not ‘I wish I tried that’. You don’t need rhythm, dancing ability, or even confidence. That just seems to come. Just by stepping out your comfort zone and trying something new. It might not happen even while you’re there, you might not even notice, but you’ll have changed. Pick a festival that isn’t the run of the mill, that isn’t ‘where you go after schoolies’. Try them all. If you manage to get to Burning Man, please, please keep an eye out for the giant hippies with dreadlocks that don’t have peace and happiness in their eyes, more “I’m going to break your neck and turn you into a fart bucket” stare. I’m guessing a certain pair of Google founders may be nearby. 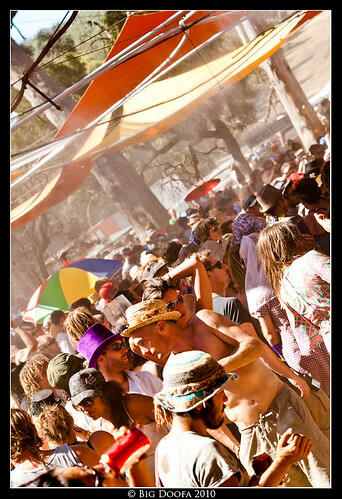 The closest you’ll get to Burning Man in Australia would be Rainbow Serpent. With subtle twists, that make it truly Australian such as a blessing ceremony by the same beautiful indigenous lady that has done it every year! By far, one of the most absurd and enjoyable experiences of my life. Learn a few things about sustainable living, accidentally eat a meal from a different nationality every day, gyrate nervously to the music until that sudden epiphany: no-one cares, no-one sees me as fool, no-one is watching you to see you fail, everyone wanting to see a smile and reckless abandon from letting go in some unbelievable surrounds. Decide how you want to look back on your life when you’re on your death bed. Push those boundaries. Try something new. Look me up if you’re coming. I’ll be at the front, leaving my work and stress and inhibitions at the gate. Venombytes © Tom Meier 2019. Valid HTML5 and ATOM. Powered by Enki.